Tsepak Rigzin received his B.A. and M.A. from Punjab University, B.Ed. from Annamalai University, India, and traditional Buddhist training from the Institute of Buddhist Dialectics. He is the author and co-author of numerous books and articles on Tibetan Buddhism and he has extensive experience in written and oral translation. From 1980 to 1993, Rigzin led the Research and Translation Bureau at the Library of Tibetan Works and Archives in Dharamsala, India, producing numerous articles and books, and attending international seminars, workshops and conferences. During the ten year period from 1993 to 2003, he held high ranking positions as Rector, Principal and Education Officer with Central Tibetan Schools. For two consecutive years, he served as translator and spokesperson for Mystical Arts of Tibet, touring with the monks throughout North America and Europe. 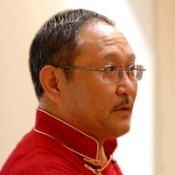 Rigzin began teaching Tibetan language courses at Emory in August 2009. In addition to his teaching responsibilities at the university, he served as Scholar in Residence and official translator for Drepung Loseling Monastery in Atlanta, where he dedicated his time to outreach programs and also teaching the Tibetan language.